JAZZ CERTAINLY WAS HOT IN EDMONTON BEFORE THE "UP-START" TROC BALLROOM! Anybody given you hell yet for the suggestion jazz didn't reach Edmonton until 1946? Don't forget this was a swingin' town during the Second World War! Lots of American flyers and GIs, with the Alaska highway underway and Blatchford field setting records for landings and takeoffs by Lend-lease aircraft. The Trocadero was a Johnny-come-lately in all that. Jazz was pretty much over before it opened - the Troc prospered because the town was ready for a slightly higher-class dance hall. then. You'll enjoy the stories! 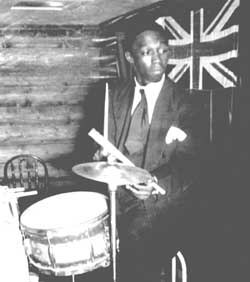 Long before the Troc Ballroom, JAZZ was a staple of Edmontonians, and the military.